This T Shirt is designed to intervene in the space around the one who wears it. I believe that the ultimate aim of politics should be to create sincere relationship through humans. When politics, though, is creating boundaries between people, well, then, I think, to disappear becomes a political gesture. 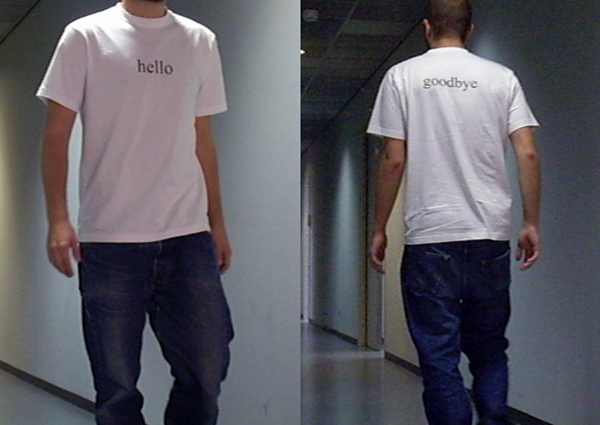 My fascination for hiding and disappearing in the public space made me design this T Shirt that simply holds the messages “Hello”, on the front, and “Goodbye”, on the back. I was wearing this T Shirt at university and I didn’t have to talk to anyone. To conclude, I like to think that this design tells something about our relationships nowadays, about the fact that they are fragmented and precarious.